Implied volatility has spiked higher amid rising geopolitical tensions but remains below the historical average. This month, we look at how investors should act in a higher volatility environment and the potential opportunities that follow suit. In Australia, the S&P/ASX 200 continues to trade in a very tight range, as it has done over the past few months. The reporting season kicked off at the start of August but the bulk of companies will only report in the latter half of the month. Thus far, there has been more disappointments than positive surprises, but overall earnings growth has so far been about in-line with consensus expectations. It is also the tail-end of the US quarterly earnings season, which has been positive over the month. The S&P 500 pushed higher throughout the past month but lost its gains upon Trump’s ‘fire and fury’ comments against North Korea, while European and Asian equity indices fell over the month on the back of the growing geopolitical tensions involving North Korea. Meanwhile, defensive assets rose, as bond yields outside Asia have fallen following the risk-off sentiment, despite the looming kick-off of the unwinding of the US Federal Reserve’s balance sheet. The US Dollar remained weak on political concerns and disappointing economic data. The Australian Dollar rose slightly to 79 US cents over the month despite weakening against other major countries such as the Euro and Yen. During the past month, the Australian Prudential Regulatory Authority also released its update on bank requirements, with the new capital requirements set to rise to 10.5% in 2020 from 9%. This was a positive for the local market as analysts view these new requirements as achievable without the need to raise further equity, therefore removing one of the risks that have clouded the view on the domestic banking sector for months. The Australian economy continues to show some signs of improvement, as employment rose by 14,000 jobs in June, with 62,000 new full-time jobs. The shift from part-time to full-time employment follows months of high business confidence readings. Unfortunately, wages and consumer sentiment have failed to follow suit, leading to continued weak inflation, with the 2016/17 Financial Year reading at 1.90%, below the Reserve Bank of Australia’s target. Similarly, the US employment figures were very strong but wage growth remains elusive, leading to weaker than expected inflation figures, leading to doubt in the markets that the US Federal Reserve will be able to maintain its current target rate trajectory while beginning to unwind its balance sheet. Economic data across the board continues to indicate a continuation of the ‘Goldilocks growth’ trend with the world in a period of synchronised growth that is not strong enough to raise inflation concerns, and not weak enough to raise recession concerns. Despite the positive trends in the global economy, politics pose potential shocks for markets. Geopolitical risks surrounding Kim Jong Un’s persistence in displaying North Korea’s defiance against the rest of the world by continuing to test and develop nuclear armaments have been the headlines in recent weeks, although many experts say that the probability of a war is not higher despite Trump’s aggressive comments on the subject. Another major risk would be the US Congress failing to raise the debt ceiling as its fiscal deadline looms, risking another shut down of the US government. This highlights the political stagnation in the US as the Republicans continue to focus their resources on the health care bill despite multiple failed attempts to push through the repeal of Obamacare, while there have been no signs that Trump’s tax reforms and infrastructure spending plans are progressing. Amid this environment of heightened geopolitical tensions, volatility has started to return to the markets. In the previous issue, we looked into the reasons for the low volatility environment and warned that the calm could not last. Within our portfolios, we have been urging investors to stay cautious amid the high valuations across asset classes and low volatility across the board, in a period where debt levels and geopolitical risks are elevated. Last month, we identified the unwinding of the Fed Balance sheet as a potential trigger for a re-basing. Since then, volatility has indeed spiked, although the cause was escalating geopolitical tensions around North Korea, primarily driven by rhetoric between US President Donald Trump and North Korea’s Kim Jong Un. 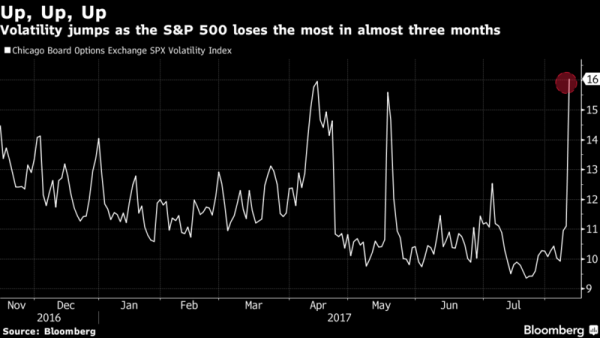 In the two days where Trump threatened to deliver ‘fire and fury’ to North Korea, and the subsequent retaliation from Kim Jong Un by announcing to further test its missile capabilities, volatility spiked a massive 60% and sent risk assets sharply lower. The VIX index shown above tracks the market’s expectation of 30-day volatility, or in other words, the market expectations of risk. While the steep spike has left the VIX at its highest in a year around 16 points, this is still below the long-term average of 20 points, highlighting the potential for a further rise. Importantly, because the VIX index is a measure of the market expectations of future volatility, it is not a measure of actual volatility (this can only be measured using past data). Like all forward-looking indicators, the VIX index isn’t a measure of what volatility will be, only what the investors think that volatility will be. In other words, it is a measure of investor sentiment, or the ‘investor fear gauge’. It is important to remember that actual volatility is a measure of the size of moves in the market and does not take into context the direction of the move. Therefore, a higher volatility environment could mean sharper gains rather than steep falls. While the spike in the VIX index may indicate a shift in the focus to elevated geopolitical tensions at a time when valuations and debt levels are high, investors should always consider both sides of the coin. Economic growth and employment trends have improved across the world, while company earnings have rebounded in the last two-quarters. Monetary policy continues to be supportive, with interest rates low despite the US Federal Reserve having already raised rates twice this year. So, there are still many positive drivers that could continue to push risk assets higher. Consensus estimates continue to indicate revenue and earnings growth as the economic momentum continues. Barring actual actions following the war of words between Donald Trump and Kim Jong Un, any significant pull-back in risk assets could offer the opportunity to buy. However, the heightened volatility and market sensitivity is likely to highlight the need to stay diversified and manage risks prudently. In the event of a downturn, it is important to have defensive assets such as bonds and cash that preserve capital, offering the opportunity to rotate into risky assets such as equities as they become cheaper. Higher volatility also offers this opportunity within asset classes. In the fixed income space, cash and government bonds can be rotated to credit or high yield debt if spreads widen to levels that adequately reward the additional risk involved. Similarly, in the equity space, rotation between stocks that become overvalued to undervalued ones can offer improved performance and potential downside protection. It is also important to note that at the trough of the Global Financial Crisis, the investors who gave up and cashed out would have realised extensive losses, as well as missing out on the massive subsequent gains. History has shown that it is a fool’s game to try to time the bottom or the top of a market. What is important is to be aware of the risks involved, and manage your expectations and exposures accordingly. Therefore, it is important for investors to keep calm and carry on investing rather than giving up and cashing out completely, especially in the low interest rate environment where the interest earned on cash barely covers rising inflation (or in some places, is guaranteed to erode your spending power as the inflation rate is above the interest rate). Investors should keep in mind the amount of risk they are willing to take relative to the potential returns on offer and adjust their positions accordingly as the investing environment changes.